We create highly life-like, online manufacturing training courses that include 3D-animated training videos to teach manufacturing employees to perform their jobs. In some ways, these animated training videos are very similar to the kind of video you’d record with a video camera: the video you watch is a very life-like, realistic representation of the work environment and machines employees work with every day. But we can do some things with these animated manufacturing training videos that you can’t do with “normal” videos from a video camera. For example, you can zoom in really close–to microscopic levels. You can zoom out very far, beyond what a camera can do. You can quickly change the viewing perspective from one part of the work area to the other. You can add highlights and arrows to point out important things. You can create “special views” that show the inside of a machine that would ordinarily not be visible. You can create images of things that would be too dangerous to film with a normal camera, perhaps because of dangerous machine motion. 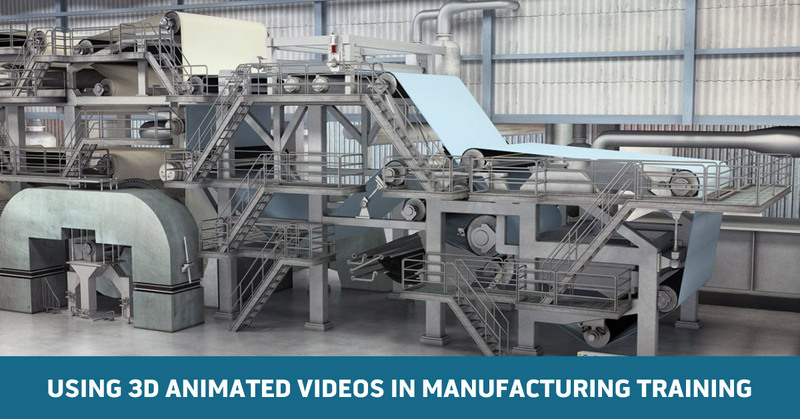 All these special capabilities of using animation allow us to make online manufacturing training courses that do things other courses, even video-based courses, can’t do. In short, our online manufacturing training courses can visualize all sorts of amazing things, as you can see below in this sample from some of our online manufacturing, maintenance, and industrial skills courses. To demonstrate this more fully, and show you some more detailed examples and our general work process, we’ve explained each of the steps of a recent project in more detail below. The demonstration below is pretty similar to how we create a lot of projects. In it, we were making a 3D model of a tissue manufacturing machine (for those not in the know, this is a paper manufacturing machine specially designed to create tissue used for paper towel and toilet paper). Convergence Training are manufacturing and industrial maintenance training experts. Click the links below to learn more about how we can help you. We’ll explain each step of the process in more detail below. We begin by meeting with the customers, learning about the employees and the job tasks the employees perform, and becoming more familiar with the work processes, work area, and associated machinery. In short, we perform a training needs analysis (click that link to learn more about this) to determine the best training to make for the employees. This step is essential to making the best manufacturing training possible. We then design the manufacturing training solution, which includes creating storyboards that serve as the “blueprint” for our manufacturing training courses. Teams of instructional designers, curriculum writers, and subject matter experts work together to create these. When complete, the storyboards are returned to the customer for final OK before production begins. 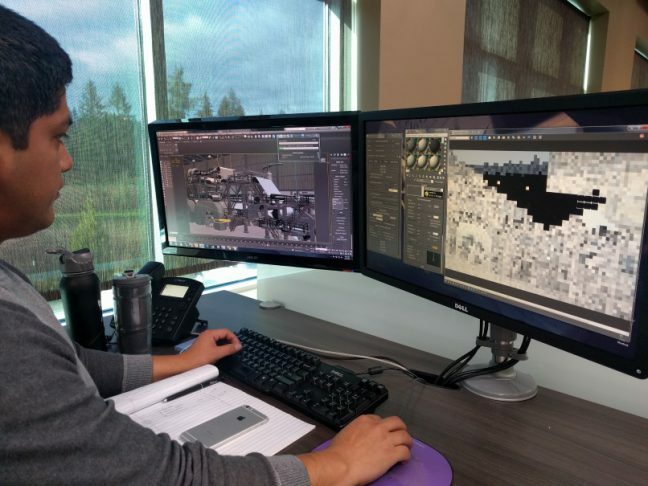 At the same time that we begin storyboard creation, we also begin creating a 3D model of the machinery the employees work with and the work area they work in. Ultimately, this 3D model is incorporated into a series of short animated training videos (30-60 seconds, typically) which are themselves included in one or more eLearning course to teach employees to perform their job. 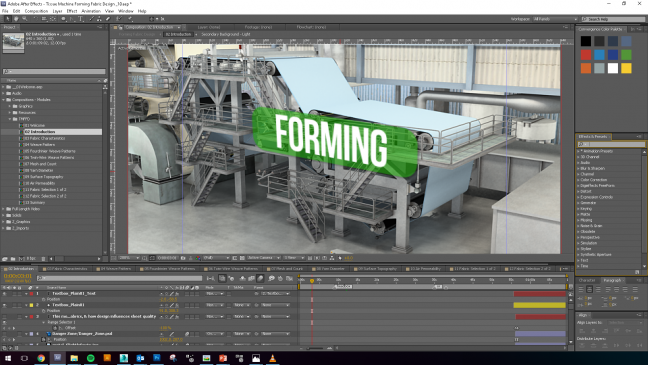 Here’s media designer Jul Sumaran at work creating an animated 3D model of a large tissue manufacturing machine. Jul uses a software program called 3D Studio Max to make animated 3D models like this one. Here’s a closer look at the software program Jul was using while making this 3D model. And here’s the 3D model after Jul finished it. 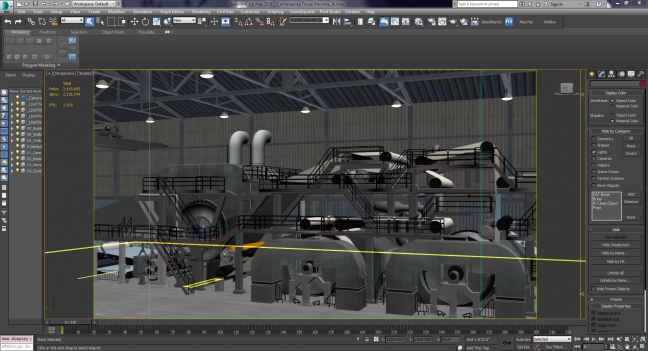 Because the tissue machine is so large, our animated 3D model is quite large as well. So the image above may not appear all that impressive when viewed in the small displaying area allowed by this webpage. But check out the short fly over view below, which we made with the 3D model above. This gives a single, small example of the kind of video wizardry we can create with the 3D model as a foundation for our animated manufacturing training solutions. We can also zoom in on components within the tissue or machine or even sub-components–all the way down to views that are very highly magnified. Below are a few examples of that. We’ll return to the different sections of the tissue machine shown below in the later parts of this explanation as well. 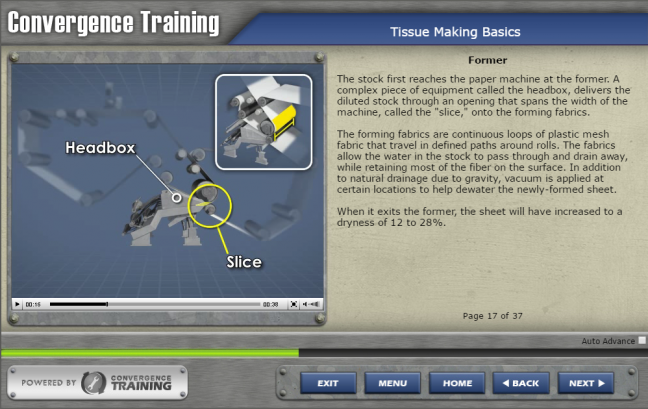 The image below shows the Forming Section of the tissue machine. In the forming section, a soupy, watery paper “stock” is sprayed on top of flat forming fabrics (the blue material on the right side of the image below). Water from the watery paper stock drips through the forming fabrics, leaving behind the pulp on top of the forming fabrics. It is this pulp that ultimately exits the tissue machine at the other end as a single long, wide sheet of paper. The image below shows something called Through-Air Dryers (also called TAD Dryers).The TAD Dryers are the two drums at the bottom of the center of the image; each drum is covered by a hood that looks like an upside-down U. 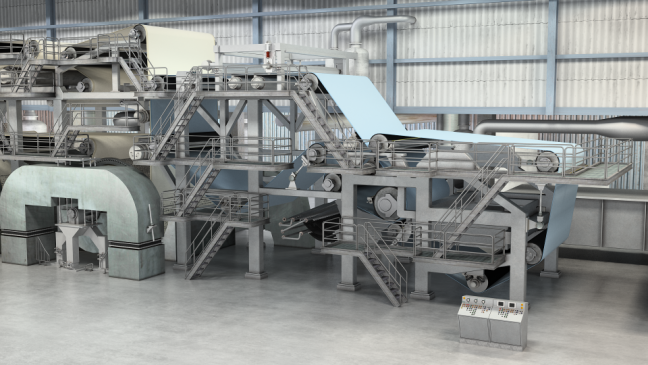 The wet paper stock travels to the TAD Dryers shortly after leaving the Forming Section. 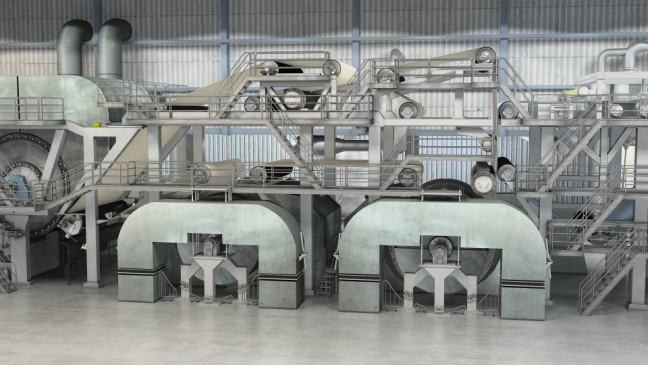 When the still-wet pulp enters the TAD Dryers, it is exposed to hot air that partially dries the paper sheet during its machine-length transformation from a soupy, pulpy broth to a dry, continuous sheet of paper. And the image below shows the Yankee Dryer and the Reel. The Yankee Dryer is the large drum at the center of the image (you can still see the TAD Dryer on the right of the image).The still-wet paper sheet rotates along the Yankee Dryer, which is heated internally with steam to remove moisture from the paper sheet. You can also see the Reel near the bottom of the left-side of the image–this is an ever-growing roll of paper created as it gathers up the continuous long sheet of dried paper exiting the machine. We mentioned earlier that we can do a lot of things with this 3D model to create animated manufacturing training videos and courses you couldn’t do with normal video. We’ve demonstrated the ability create a fly-over video and also to zoom in on specific parts of the tissue manufacturing machine. And at the top of the article we mentioned many other things we can do, such as adding highlights and arrows, showing hidden views, and so on. 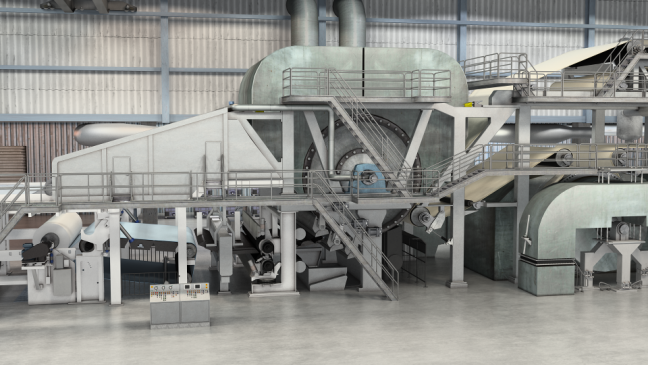 You’ll see examples of some of these later in this article, or you can read more about 3D animated training videos for manufacturing training here and here. Once our customers have OK’ed the storyboard, which includes the written version of the audio narration script, we send that script out to be recorded by professional voice talent. When we get the audio narration back, we synch it with the videos that employees see within the final eLearning courses. The next step of the process is to begin with the 3D model that Jul created and then use it to create a series of short animated training videos, each about 30-60 seconds long. These will be the videos that employees watch while completing the final manufacturing training course. There’s one video per “screen” within the course. Each animated video can include images of the 3D model of the tissue machine, but the video can include much more than that too. 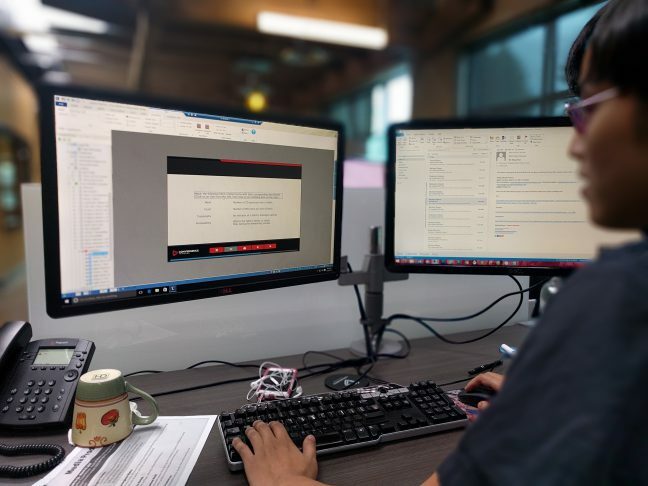 That includes the audio track, of course, but also things like highlights, arrows, and text that will appear on screen; photos; drawings; and anything else that will help the employees learn to perform their job more effectively. Here’s media designer Stephanie Bailey at work creating those animated training videos. And here’s a closer look at the software program Stephanie uses to create those manufacturing training videos. You can see the “time track” at the bottom shows the different elements, each with their own in and out time points, that Stephanie weaves together to create the animated videos. For example, in the screen grab below that shows the software program Stephanie used to do this, you can see where she added a green highlight and the word FORMING. Here she’s really adding multimedia to the manufacturing training video experience. (You’ll see some examples of the videos Stephanie made shortly). 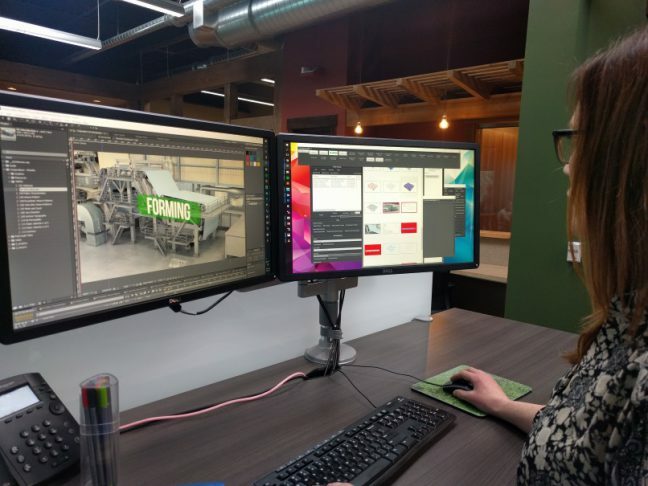 In the next phase of the project, we take those animated videos Stephanie created and use them to make an eLearning course as a manufacturing training solution. In addition to the training videos created earlier, we make practice questions and a test during this phase. 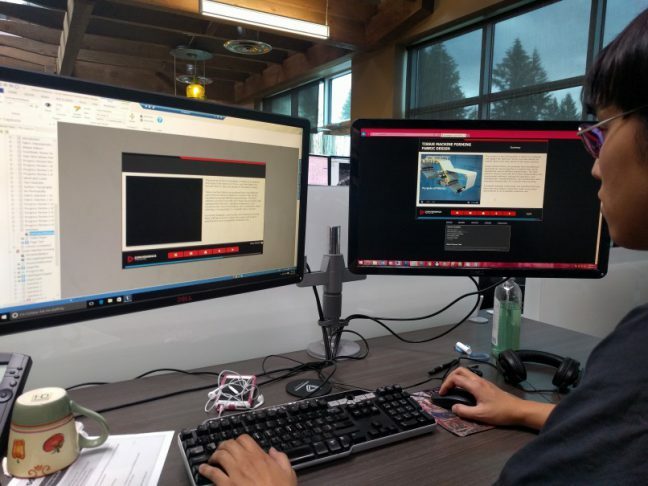 The image below shows Course Authoring Specialist Thomas Truong using an eLearning authoring tool named Lectora to create the actual manufacturing training course. As you can see, he’s building one of the screens in the course that includes an animated video Stephanie made. When an employee views this screen, he or she would see the training video synchronized with the recorded audio narration. 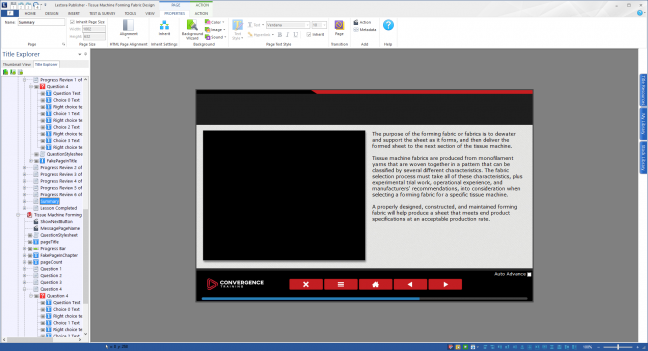 Thomas also uses the eLearning authoring tool software to create unscored practice questions within the eLearning course and a scored test at the end. That’s because a complete manufacturing training solution can’t just deliver content–it’s got include opportunities for the learner to practice and test his or her knowledge, provide helpful feedback during that practice, and ultimately assess mastery of the training materials. The photo below shows Thomas creating one of the test questions. It looks like he’s building a “matching” question. And here’s a closer look at the software program Thomas used to create the actual manufacturing training course. Finally, here Thomas’ thoughts about the course authoring part of the animated manufacturing training course development process. At the end of the process, we’ve got one (or more) complete online training course to teach employees at a tissue manufacturing facility to perform their job tasks. The image below shows one of the screens in that cold (we’ll include some video samples below as well). At this point in the animated video, learners see a very small part of the animated 3D model of the tissue machine that Jul created. We’ve isolated this part from the rest of the machine to focus the learner’s attention on one specific aspect. This is something you can’t do with “normal” video. During the compositing phase, Stephanie (1) used parts of Jul’s 3D model, (2) added text, pointers, and and circle to focus attention and clarify, and (3) added an insert image in the top right corner. This is a small example of the techniques Stephanie uses throughout the course to improve the learning experience in this manufacturing training video. Although the animated video includes an audio narration, the right side of the screen also includes the script of the narration for those who prefer to read instead of listen or for the hearing impaired. It’s important to remember that manufacturing training solutions are used by a variety of people and in a variety of situations, so flexibility is key. 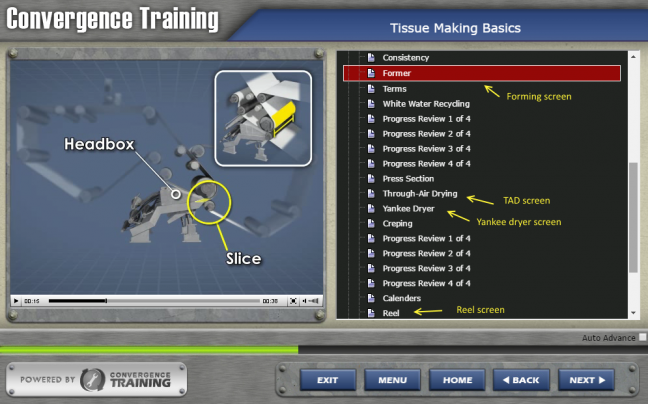 The image above shows just one moment of one screen in a multi-screen animated manufacturing training course. The image below hides the audio narration transcript and shows a list of the screens in the course. We’ve used yellow arrows and text to point out the screens on the Forming Section, the TAD Dryer, the Yankee Dryer, and the Reel since you’ve seen images of those near the top of this article. So now let’s look at the videos for the four screens we just pointed our as they appear within the final 3D manufacturing training video. Here’s the video of the screen about the former. Here’s the video of the screen about the TAD dryer. Here’s the video of the screen about the yankee dryer. And here’s the video of the screen about the reel. Feel free to check some more samples of our general manufacturing training courses, as well as training courses developed specifically for workers in the pulp, paper, tissue, and corrugated board industries. Using 3D models and 3D animated training videos to create manufacturing training courses makes it the training more engaging for learners. It also eases comprehension, making it easier to understand, and increases retention, meaning workers will remember the training materials more effectively. All this means the workers are more likely to apply the new knowledge and skills on the job and ultimately help the manufacturing company attain and even exceed their business goals. And studies even show that workers complete eLearning courses faster than they do other forms of training. What’s not to like about that–better manufacturing training in less time! If you’d like to take a deeper dive into training development for manufacturing, please read our Manufacturing Training: 6 Steps to Doing It Right article. Let us know if you have any questions! We’re happy to help. 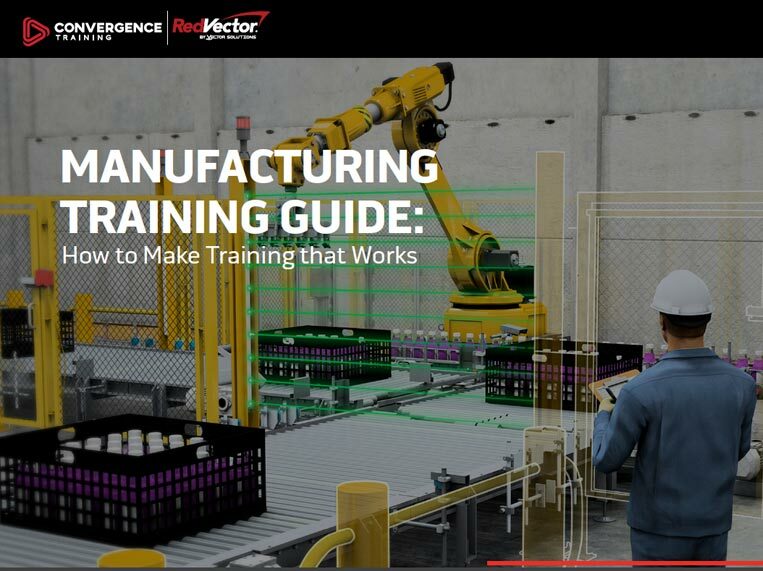 And don’t forget to download the free Manufacturing Training Guide below!